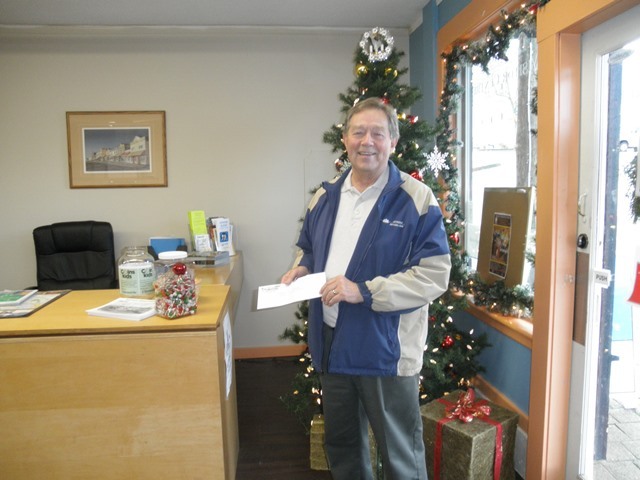 Merry Christmas Quinton Bowles who won 1st Prize in the Ladysmith Chamber of Commerce Guess To Win Candy Contest. 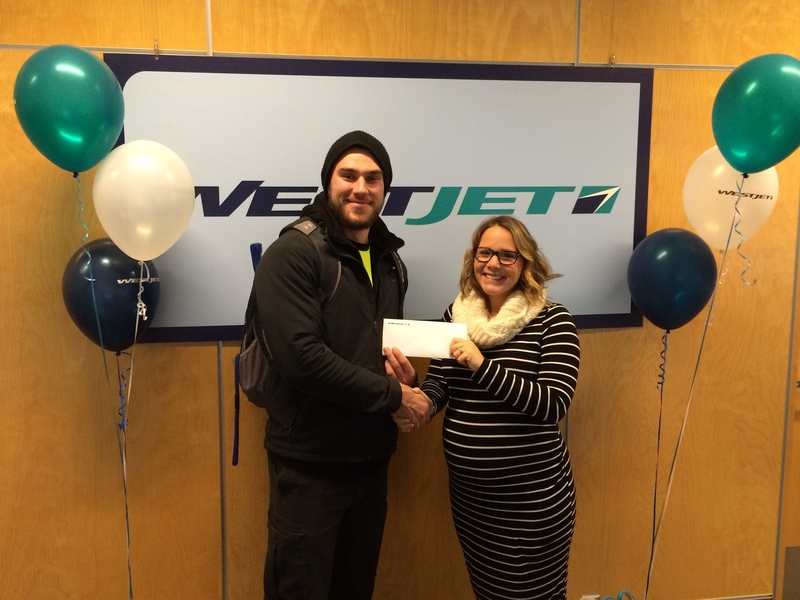 Presenting Quinton with his Trip for 2 anywhere WestJet flies is Tammy Appleton, local Station Manager for WestJet and Ladysmith Chamber Board Member. Quintons guess of 643 candies was bang on! Congratulations Quinton, bon voyage! 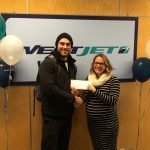 Thanks WestJet for your amazing generosity and Community Spirit! Enjoy your unforgettable adventure and two-night vacation getaway at April Point Resort or Painters Lodge, courtesy of Oak Bay Marine Group. Watch out for bears! Enjoy your 2 night getaway in the Penthouse Suite at Yellow Point Lodge! That’s right, relax and enjoy at one of Vancouver Island’s favorite rustic retreats! 4th Prize went to Ed Shirley. A $200 holiday feast gift certificate courtesy of 49th Parallel Grocery. 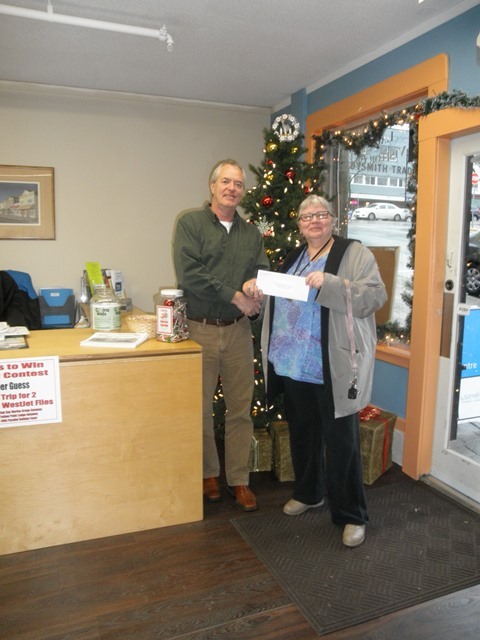 Ed & Rhonda Shirley of Hawley Place B&B plan to donate their prize to the Ladysmith Food Bank. Thank you 49th Parallel and Hawley Place, winners all around! 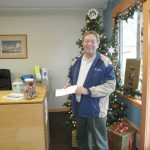 Thank you to everyone who participated in the Contest and for supporting the Ladysmith Chamber of Commerce. The money raised will help fund all of our work on behalf of your business and your community, and will help keep membership fees low. Rarely has a holiday candy ever been so good for you..
Four lucky entrants are going to enjoy the sweet taste of winning thanks to a fundraiser benefiting the non-profit Ladysmith Chamber of Commerce. The Chamber’s Christmas Candy Guess-To-Win contest offers a first prize of two tickets to anywhere in the world WestJet flies. The winner simply needs to guess the number of candies in a container, and come closest to the actual total. The deadline for entries is coming quickly, though. Tickets cost just $20 and must be purchased by Dec. 16. Three other prizes are also to be awarded, for trips and a holiday feast. And with a maximum of 1,000 tickets to be sold, the odds of winning could be as low as one in 250. Second prize is a two-night vacation getaway with Oak Bay Marine Group. The package, for two people, includes a stay in a resort suite and a four-hour adventure cruise. Third prize is a two-night stay for two people at the Yellow Point Lodge penthouse suite, including meals, tea times, and full use of all recreational facilities. The fourth place winner gets a $200 holiday feast gift certificate from 49th Parallel Grocery, to purchase holiday celebration menu items. Contest tickets are available throughout town, including the chamber office, 49th Parallel Grocery Store, Nanaimo Airport, Ladysmith & District Credit Union, Ladysmith Home Hardware Building Centre and Ladysmith Waterfront Art Gallery. Winners will be announced at the Chamber’s annual Christmas Social, at Cottonwood Golf Course on Dec. 16. 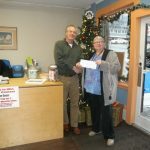 Proceeds from the contest will help fund chamber activities in Ladysmith. The organization’s more than 160 members work tirelessly to promote and improve the community for all residents.